*Gasp* Don’t worry, it’s ok! Today we got up & packed our bags to move out. This is beginning to feel like a normal part of our lives, packing our bags. It’s odd though, how one day everything fits in perfectly with space to spare and then the next time you pack up you can barely shove everything in & squeeze the zipper closed. We have decided on 2 main factors that contribute to this: (1) How far we are from our next laundry day. Our clean underwears are stored in pockets in the top of our bags, while our dirty clothes bag gets zipped into the bottom pouch. Therefore, clean clothes = can’t close the main part of the bag & dirty clothes = the bottom is being squeezed shut. (2) The amount of light in the room. Packing when all of your roommates are up & the light is on is so much easier than quietly fumbling in the dark. We walked through town one last time in search of some breakfast eats. We ended up at a bakery purchasing some pre-made waffles. We complimented this with a hot beverage from the coffee shop at the train station. Justine liked this place as it gave her a good sized coffee…not “minature sized” as she called the one she got yesterday. The tour started in the city center (obviously as we were at the Central Station). This is the historic core. There are all sorts of old, and very pretty, buildings. 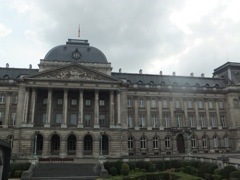 The most exciting of these was the Royal Palace of Brussels. This is the official residence of the Belgian Royal Family. Albert II is the current king and unlike the other countries we’ve been to, this monarchy is only 180 years old. It wasn’t the most grand of palaces we have seen, but we still wouldn’t pass up living in it! 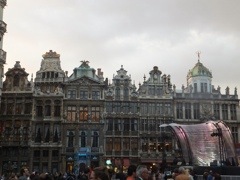 As you move away from the middle of Brussels the buildings change. There are still signs of classic architecture, but it becomes diluted by more modern buildings. The resulting combination seems to work. You still feel like you are in Europe (with it’s centuries of history that predate our country) but there is that grittiness that makes it feel like a real, working city. This is not your picture perfect, tourist town…this is a real modern city. 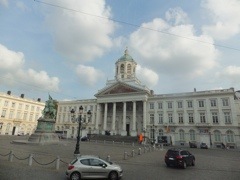 Eventually you get out of old Brussels and you reach the “European” section of the city. The buildings in this area are tall and glassy. They are sleek and modern. They have more windows than you could count. Brussels is the “heart of Europe.” What does this mean? 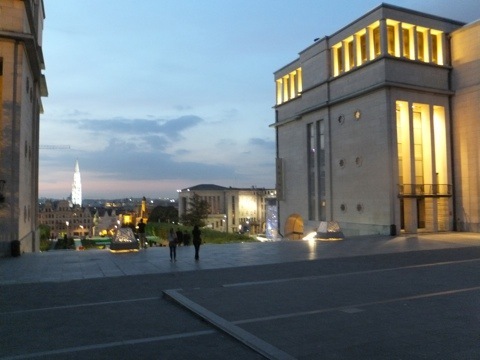 Glad you asked…the European Union holds their parliament buildings in Brussels. 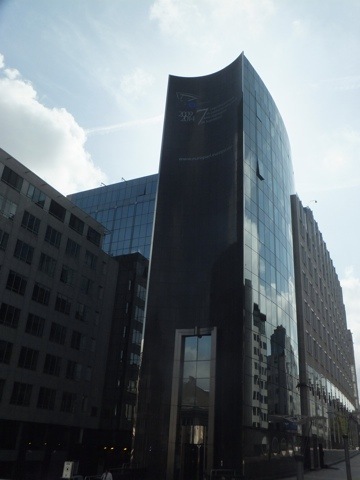 The EU has no official capital, and no plans to declare one, but Brussels hosts the official seats of the European Comission, Council of the European Union, and European Council, as well as second seat of the European Parliaments (the first being in Strasbourg, France). What all of these groups are, who knows?! But they all meet here! The EU Buildings fit into this area extremely well. We guess it is well suited that a more modern organization would have more modern buildings. It also keeps them from begin too representative of one particular country’s architecture. Glass & steel can encompass everyone. We found the EU headquarters very nice, but nothing special. As a result of encompassing everyone they don’t have a distinct look. They could have been any skyscraper downtown…but a really nice, shiny one! When we’d completed the loop we hopped off for a snack. There was a fries place just around the corner so we stopped for another traditional Belgian dish. Luckily we are getting out of this country tomorrow, before all of the fries, chocolates & waffles can make us too obese. At least we didn’t get the giant sandwich everyone else at the restaurant was getting…it was a giant chunk of baguette with a couple burger patties, a heathly dose of mayo & a large handful of French fries shoved in it. Yikes! We then started a walk back to the tour bus starting point (we’d gotten off at the last stop, not the restart point). Yes we were going to ride it again…this time we were ready to take advantage of the hop-off offer. 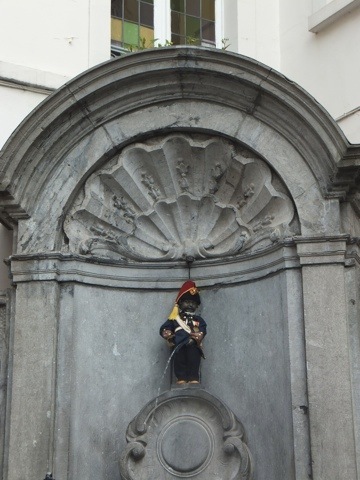 We took the long way though so we could pass the Manneken Pis. This statue was put in place in 1619 but there may have been earlier versions. We had heard one story of the reason for this statue but Wikipedia informed us there are many theories. The one told to tourists is that a merchant man had lost his son and told the people of the city if they helped him find his son he would have a statue built of what his son was doing when found. Naturally he was found peeing on a wall. Another theory, dating back to the 1300’s, claim a young boy saved the city by overhearing plans of attacking the city walls with explosives. He saved the day by peeing on the fuse before it could fully ignite. He has become a symbol of not only Brussels but the whole country of Belgium. To be honest we find it very odd… The statue was smaller than we expected. We had been picturing a life sized boy, but he is in fact only about a foot tall. He was also dressed as an old-timey soldier. Apparently a local man changes his outfit a couple times a month. The used costumes then go into the city museum. Like we said: odd. To just add to the absurdity, this little guy is on every souvenir you see. He’s on your glasses, your fridge magnets, your corkscrews, your bottle openers…we’ve even seen him molded out of chocolate. Our second loop was on a nice new bus. The commentary sounded much better than the first time around, when it was rather fizzy & had no classical music to serenade us between commentaries. The driver was also better. Did we mention how awful our first driver was? He would slam on the brakes and slam on the gas, and sometime he would do both within a span of about 3 seconds. You constantly felt like you were being throwing into your seat, then the seat in front of you! This guy knew about constant acceleration & deceleration. It made for a much more enjoyable ride. We hopped off at the Atomion. We purposely skipped this one on the loop one sights description so we could wow you with it now! 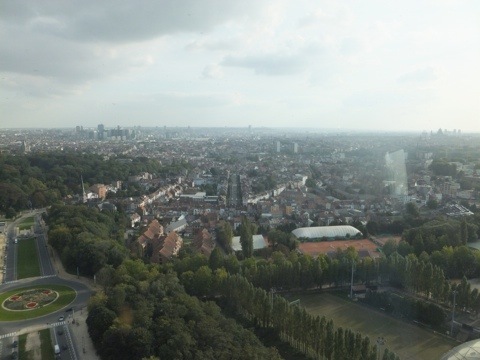 Brussels was the host of the 1958 World’s Fair. 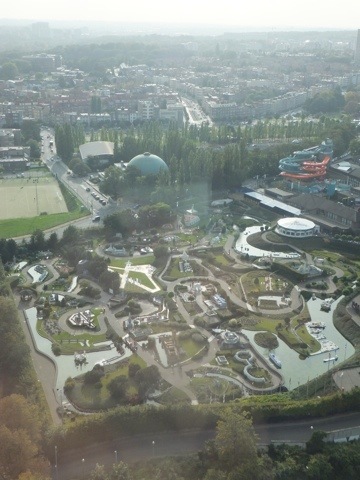 This was the 11th World’s Fair hosted by Belgium and the 5th in Brussels. 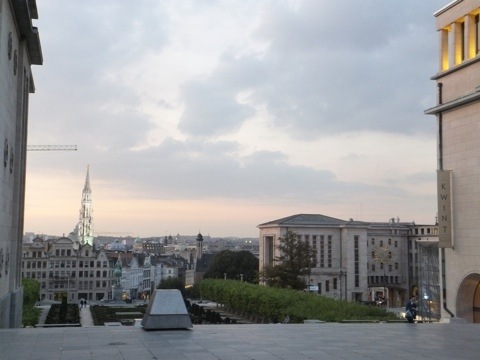 Being the first after the war and in a time when atomic energy was expected to save the planet, Brussels constructed a large monument for the fair. The Atomion is a 165 billion times magnified model of a unit cell of an iron crystal. And check out how cool it looks! 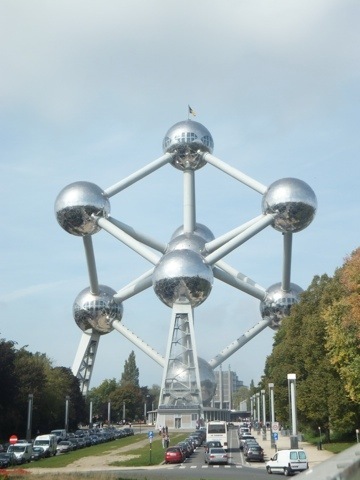 The Atomion is to Brussels, what the Eiffel Tower is to Paris. Both very large monuments built for World’s Fairs. They were both to quickly be destroyed following the Fair’s but have since become the international symbol of their cities. You were then able to navigate through the other balls and their connecting tubes. It’s crazy to think we were actually traveling through that structure. Each sphere had an exhibit in it. Some were about immigration and urban education projects (these seemed out of place & we hard to follow) and some were about Expo ’58. 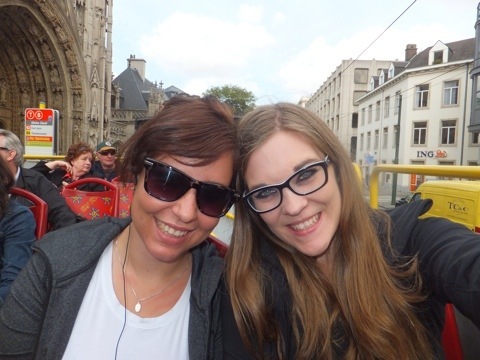 Justine had learned lots about the World’s Fairs in Paris in her history of Paris class 🙂 But for Kristin it was nice to hear things about an Expo Fair other than that in 1986 Kelsey tried to push her stroller and pretended to drive the motorhome. 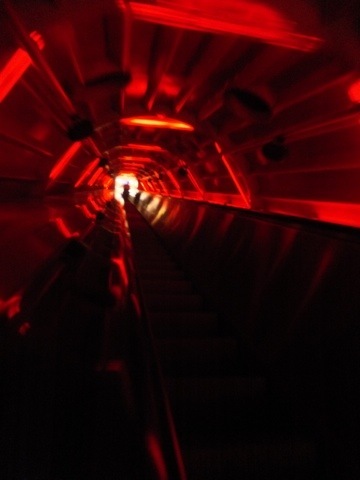 One tube trip was via escalator and looked similar to the start of the Space Mountain ride at Disneyland. It also had music playing so we had an escalator dance party. After our crazy atomic trip we went for supper. Our “Tourist Map made by Locals for Poor Young Backpackers” map (yes there is one for Brussels too) pointed us towards a great deal. There is a quaint type Chinese restaurant a few blocks out of the central city area. 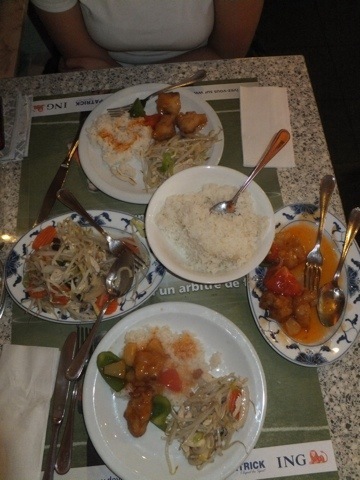 I had a great “Plate of the Day” deal where you get one of two Chinese dishes for €5.80. We got one of each and split it. Those dishes are Chicken Chow Mein and Sweet & Sour Fish, for those of you without Chinese food recognizing super powers. With our bellies full we hit the streets. It was time for a grounds eye view of the town, down where you could actually get a feel for it. We wandered through the tourist area and onto some main side streets until we reached the central square. This just made us appreciate Brussels more. The place has an awesome vibe. 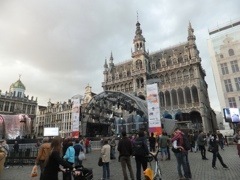 In the Grand Place they were setting up for a concert that’s tomorrow night. It created a clash of eras that mirrored the city. There was this modern stage with camera & lighting equipment set in the center of amazing architecture from eras long passed. And somehow it just worked. Love it! Just to set things straight, we don’t write that slowly. The sun set fast.